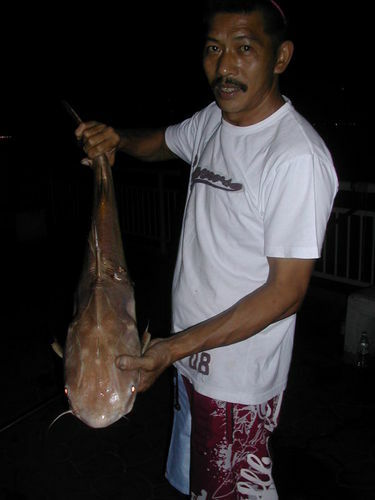 Roco caught this 5.5kg Folk Tail Marine Cat Fish when the tide is mid way up. It took the bait so hard that it screech the reel alarm and tug the rod out off it original position. Roco strike hard and the fish was swept along with the strong current flow. After some good pump on the rod manage to bring it close to the jetty. He ask me to take over as he went to prepare the gaff. I bring it to the water surface and he gaff it up.